I am a badger who enjoys a good story, a story that has layers within layers – like an onion. A story that reverberates and leaves you thinking, pondering it’s meaning. I like a good ponder! I was pondering the other day how men deal with grief when I remembered a story that came down through the clan about the Dragon Mairgbron. It was possibly my great, great, great grandfather who told the story or perhaps it was a story that was told to him. Being an Aussie Badger I have lost many of the stories of my Celtic clan. The story went along these lines. The Dragon Mairgbron had taken up residence in the ruins of Elim’s castle after Elim was slain in the battle of Aichill. The once mighty castle was in ruins, its roof open to the elements. Rich tapestries that had hung, gold threaded, rich dyed were now threadbare, mildewy and surrendering to gravity now rested on the floor in an inglorious heap. The proud stone blackened and cracked from the heat and fire of Mairgbron. The castle was more desolate than a cemetery on a wild wintry day. People had moved away, chased by the air’s toxic sulphur that caused itching to their eyes and massive rashes to their new borns. Even the badgers had fled, having read the signs when the mighty shadow of Mairgbron first crossed the sun and blotted out the day. 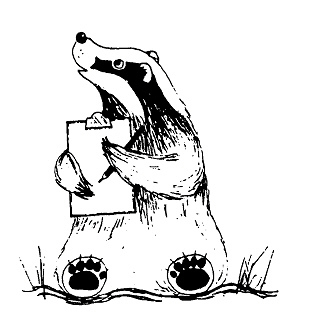 Eighty years Mairgbron had been in residence and during these long years the badgers had kept an eye on things. The land around the castle was after all their territory and badgers do not give up their land lightly even for a dragon. The badgers observed men coming to the Castle. Some left, most didn't some came with swords, some with chains. The badgers watched and pondered and came to understand that the men came to fight and try to overcome Mairgbron. The men were already wounded, some realized their wound, many did not but all had been told that if they could defeat Mairgbron they would know healing, freedom, liberty and a return to life as it was. Yet Mairgbron remained undefeated. The heat of his flame melted their shields; their swords were not long enough to pierce his scaly skin. Men tried to sneak up and bind Mairgbron with their chains. Even if he were in a deep sleep and did not stir while they wove their chains over him and around him, on waking he would rise on his back legs and shake his body causing the chains to break and whip through the air with lethal force. The skeletons of those who had tried and failed lay scattered waiting till Mairgbron’s fire turned them to ash. Into this desolation a man wandered one day as if by accident. Like the others before him, he was wounded yet he carried no sword or chains. He entered Mairgbron’s lair as if in a daze. The dragon stirred and with a spiteful gaze eyed him as if gauging how much fire he would need to immolate this man. The man did not return Mairgbron’s gaze, in fact he did not look at the dragon at all instead looking skyward through the patchwork of charred and broken rafters he sought the fragmentary glimpses of the sun. Then finding a pillar close to the wall where Mairgbron could not reach him he sat with his back against the pillar and faced away from the dragon. Mairgbron was perplexed, no man came into his presence and ignored him. All men faced him, they rushed at him, came in close, so close he could smell their fear, their pain, the gangrenous septic odour of their wounds. Mairgbron waited, the man sat. Mairgbron grew restless, still the man sat. Finally Mairgbron filled his belly with fire and breathed out; the fire licked the pillar, heating the stone, dividing in two it sought to circle the pillar and in a circle of fire burn the man who ignored him. The heat radiated around the man, tightening his skin, he could feel his moisture evaporate, his skin cracking like a sun-parched mud hole. Yet while the heat scorched him, the flames could not reach him and so he sat. He sat and waited and watched as the morning star rose. Days passed, each day a repetition of the day before. The man’s skin was nuggetty brown, drawn tight across his bones stretched like a drum hide from the radiated heat of Mairgbron’s fire. Each morning he watched as the morning star rose. Mairgbron’s frustration rose in intensity, never before had he been treated with such disdain. This man would not face him; this man ignored him and sat. Mairgbron raged, his fire hot yet all he succeeded in doing was melting stone. He could not defeat this man with his fire but he had a second strategy. He crept close to the pillar and lay down; he turned the fire in his belly so low and filled the space with icy blackness. This was no ordinary icy blackness; it was the blackness that drove men to despair. Its fog like tentacles crept around the pillar, grasping greedily as if to feed of the man. Still the man sat and watched the morning star rise in the sky. Early one morning, the man stirred. Mairgbron grew alert; finally he would destroy this man who had shown such disregard. Slowly the man stood, clawing his way up the pillar for he had sat along time and his joints were stiff and locked. Finally, standing he stepped out from behind the pillar, looking directly at Mairgbron he bowed, smiled turned and walked out of the ruined castle as the morning star rose in the sky and a new day began. A tear rolled down from Mairgbron’s eyes. Grief is sometimes like a dragon that threatens to burn us. So often as men we try to control or manage our grief yet we need to learn to sit with it. To sit and wait while the fire rages and we feel the heat of pain and torment. We need to sit and wait in the days of icy despair. Each day the morning star rises and one day we too rise, we bow before the grief that is now part of us and we go out to face a new day and a new life. Life that is different because we have sat with our grief.